It is bewildering how an event remembered for its violence and brutality coincidentally left us, as one of its most enduring legacies, a piece of innocence, joy and fun which will exist in our collective cultural memory forever. World War I is the event in question that is still studied by historians today because of its monstrous and exorbitant death toll of at least nine million combatants, along with millions of additional civilian deaths. But how did this vicious conflict set the stage for the creation of the beauty, charm and delight I speak of? 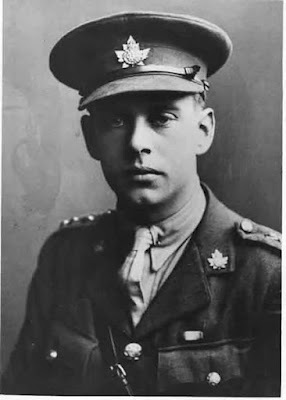 In 1914, at the outbreak of W.W.I, a man named Harry Colebourn from Winnipeg, Canada, and a number of his friends joined the armed forces of the British Empire and set off by train on the long eastward journey to the Atlantic coast of Canada where they would be shipped by boat to Europe to join in the fight. To encourage enlistments, the British Army developed a “buddy system” that allowed friends and/or men from the same town or community to join up together. They would remain in the same unit throughout training and into the fighting in Europe. This helped morale early on but had disastrous consequences as the War progressed. Many communities suffered the loss of an entire generation of young men as the casualties and deaths mounted. Harry Colebourn and others from Winnipeg, Canada, had enlisted under this program. 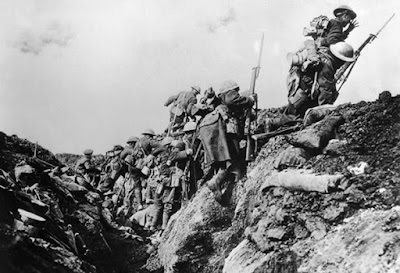 Canadian soldiers going “over the top” into “no man’s land” to attack the German lines. As Lieutenant Colebourn and his men were waiting on a railroad station platform in the small town of White River, Canada, waiting for a change of trains, Harry looked down the platform and saw something that immediately caught his attention. Having been a veterinarian in civilian life, his eyes were naturally drawn to a man dressed in hunting clothes, standing, waiting, with a gun cradled in his right arm and, in his left arm, a small, female black bear cub. Harry approached the hunter and explained that he was a vet and asked for the story of how the cub came to be in the hunter’s possession. The hunter replied that he had killed the cub’s mother while hunting, unaware that the female bear had a cub nearby. Unable to leave the cub to die and, not knowing just what to do with it, he had picked it up in his arms and taken it with him out of the forest. The statue erected in the town of White River, Manitoba, Canada, commemorating what happened next in the story. Harry asked if he could have the cub, thinking that he and his men would adopt it as their mascot in the hope that it would bring them good luck. Anyway, he said, he was a vet and knew much about the care of animals. Who better to give the cub to? But the hunter was a cunning man and noted Harry’s interest, and hoping to make some money, he told Harry that he could have the cub if he wanted it,….but for the price of $20.00. Harry immediately produced the money and the cub was his. The cub was an immediate sensation with the men in Harry’s unit. It wandered around the train, over and under the seats, and rummaged through the men’s baggage and military packs, getting into all kinds of mischief. 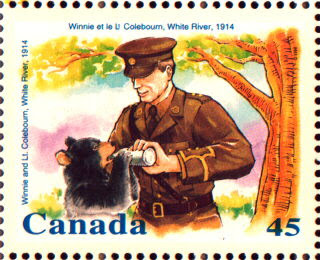 Canadian stamp paying tribute to Harry Colebourn’s purchase of the black bear cub at White River in 1914. The bear cub accompanied the soldiers on the troop ship that took them to England for training. It was said that the bear cub followed the soldiers around like a tame dog. Harry took the cub with him to many places he visited while in England, but their favorite place to visit was the London Zoo. Harry liked the animals because he was a vet and the cub liked it because there were so many other types of animals around to look at. Harry and the bear cub were a startling sight as he led her around on a leash while exploring London and surrounding areas. At night the bear cub slept underneath Harry’s bed in his unit’s barracks. Harry and his unit’s “mascot.” Who needed good luck more than soldiers going off to fight in a brutal war? By the time that Harry’s unit was called to the front in France to fight in the war, a difficult decision had to be made. 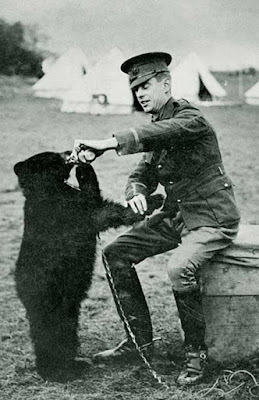 Harry Colebourn, now a Captain, knew that the trenches in the war zone were no place for a bear, so he took the young cub to the London Zoo and asked them to take care of it until he and his men returned from France. The zoo was overjoyed to have the bear cub on loan to them (there were no bears in the zoo at that time) and set up a special place for the little animal to live. 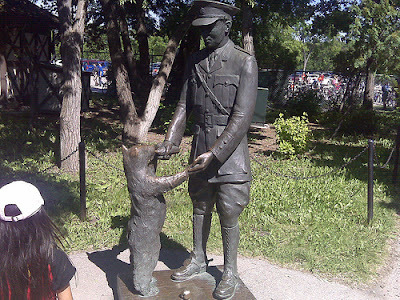 Outside the bear’s cage a sign/plaque was erected giving the name of the resident bear within: “Winnie.” Harry and his fellow soldiers from Canada had named their mascot cub after their home town, Winnipeg, Canada. Statue of “Winnie” at the London Zoo. (present day) The statue was erected in 1981. While Harry and his men went off to fight, the bear cub became a bigger and bigger bear and, finally, a full grown female black bear. She became one of the most popular exhibits at the London Zoo, especially for children, who eagerly came to see the curious, gentle animal. Harry visited Winnie whenever he got leave and was in London. He noted her growth and the delight she gave to the visitors she attracted. Harry survived the war and returned to the London Zoo in 1919 to see how his unit’s mascot was getting along. He found that the cub he had left years previously had now developed into a fully grown black bear, having become the center of interest for hundreds of children, and adults, who came to the zoo every day to see her. It quickly became evident to Harry that this was now “home” for the bear cub he had found on the railroad platform at White River almost five years earlier. In a formal ceremony in December, 1919, he gave the animal to the London Zoo where she would be taken care of and enjoyed by innumerable children in the years to come. The information card filled out by London Zoo authorities during the official ceremony during which Harry gave Winnie to the institution. 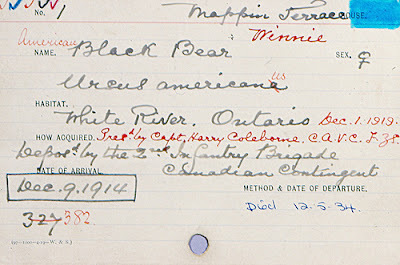 Note the date, December 9th, 1914, when Harry left Winnie at the Zoo “temporarily.” Then, note the date, in blue ink, indicating the date of Winnie’s death, December 12th, 1934, at the age of twenty. 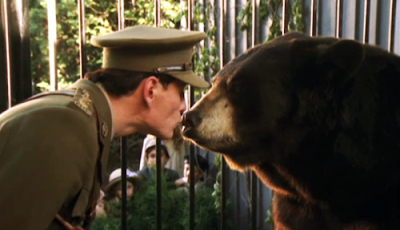 In a recent film titled “A Bear Named Winnie” Harry returns to the London Zoo in 1919 and says good-bye to Winnie. As shown, Winnie has grown up and has found a home. In the years that followed, many came to visit Winnie, but the most important to this story were a trio of individuals, two adults and one child. 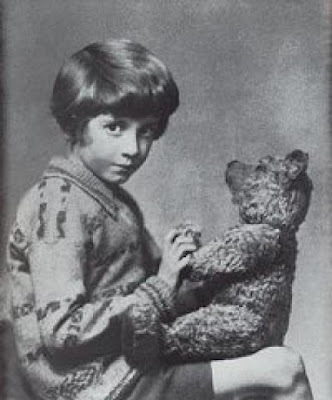 A.A. (Alan Alexander) Milne and his son (born in 1920) would often come to the London Zoo to see Winnie because she was his son’s favorite animal at the zoo. Reportedly, Milne’s son developed such an affection for the bear that he was allowed to spend time in its cage feeding it treats. He begged his father to take the bear home. Since this was impossible, Mr. Milne promised his son that he would write a series of bear stories for his son to enjoy. Historians say that it was a common sight for people to see “Winnie” giving children piggy back rides around the London Zoo and eating treats from their hands. 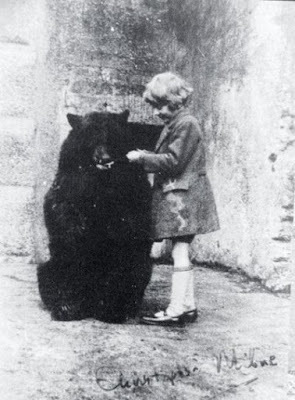 Christopher Robin Milne in the enclosure at the London Zoo with “Winnie” the bear, feeding her treats. With them often came an artist and friend of the family named Mr. E.H. Shepard. Milne’s son often brought along his own stuffed bear named “Edward” to show to Winnie and, one day, he decided to rename his stuffed bear “Winnie the Bear.” Thinking the name much too commonplace, he decided to rename the bear “Pooh”, after the name of his favorite swan on his father’s estate (known as “Cotchford Farm”) outside London. Thus it was that the name “Winnie the Pooh” was created. 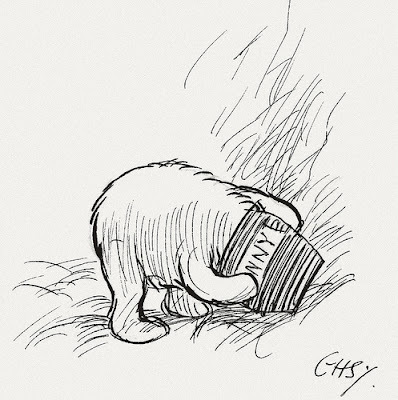 Another story about the origin of the name “Pooh” is that it was a verbal representation of the sound that Milne’s son believed a bear made when it tried to blow a bee off its nose while invading a bee hive for its honey. If you pretend to try and blow a bee off your nose you will hear the sound “pooh.” Try it! Other stories say the name “Pooh” came from the sound Winnie made (according to Christopher Robin) when blowing butterflies off his nose. 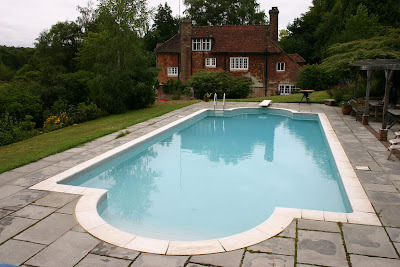 Cotchford Farm, the Milne estate outside London. Christopher Robin’s room was directly above the back door. Mr. Milne was a noted writer of considerable talent and, as the promised gift for his son, he began writing fascinating and entertaining stories about “Winnie the Pooh” and a young boy named Christopher Robin. He asked his friend Mr. Shepard, an artist, to provide some pencil drawings of the characters to accompany the stories. 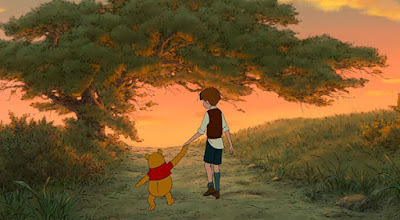 Christopher Robin Milne was thoroughly delighted and enchanted to find himself a central character in the imaginative world created by his father and Mr. Shepard. 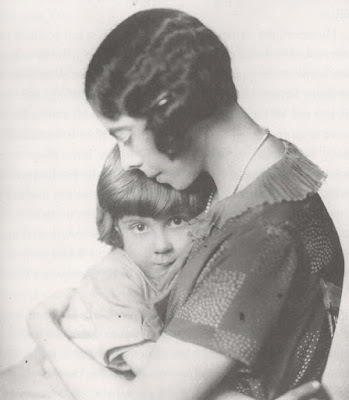 Christopher Robin and his mother Daphne Milne. The adventures brought into being by his father included characters based upon the many stuffed animals found in the playroom of the young boy. Other characters, such as Owl and Rabbit, were based upon the animals found in the surrounding woods of the family estate, Cotchford Farm. Others were just imagined or made up. An interesting note is that the Milne family owned a donkey named “Jessica.” She lived in the wild, open fields of Cotchford Farm. As a child, Christopher Robin used to ride Jessica down the hill and into the nearby village of Hartfield to visit a candy shop. Christopher then bought treats for both himself and Jessica. 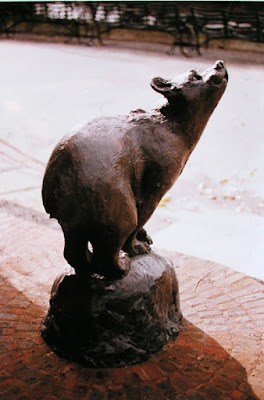 Years later, the grown-up Christopher Robin said that Jessica had, “…no connection whatever with Eeyore.” What influence Jessica had on Christopher’s father in the creation of Eeyore is not known. A mystery. 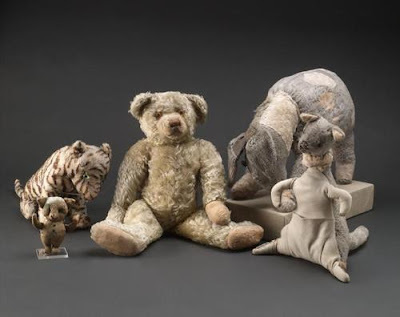 These are the actual stuffed animals owned by Christopher Robin Milne. In these toys you see the origin of the characters Pooh, Eeyore, Roo, Kanga, Tigger and Piglet. The estate itself was part of a larger area known as Ashdown Forest, which provided the inspiration for the setting of all the Pooh stories: the Hundred Acre Wood. 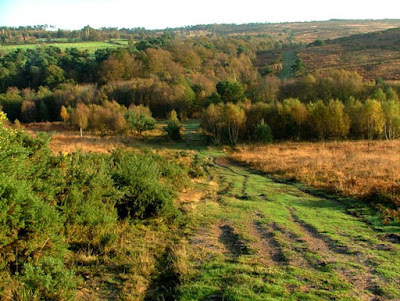 Present day view of Ashdown Forest, the basis for “The Hundred Acre Wood” of the Pooh stories. 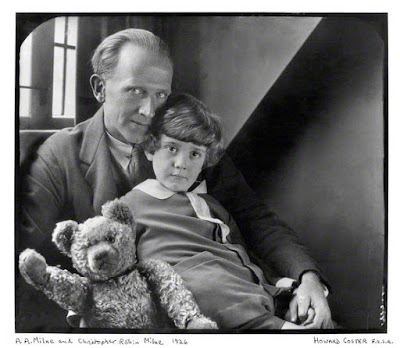 The delight in his son’s eyes in reaction to the stories and magical universe he had created inspired A.A. Milne to continue writing. 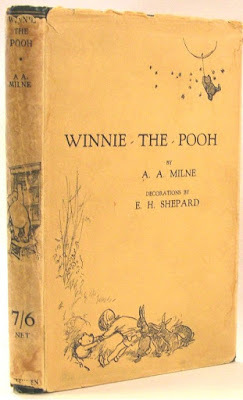 Finally, in 1926, with the assistance of Mr. Shepard for the illustrations, the first of these stories were published in England in a volume titled The Adventures of Winnie The Pooh. This was followed two years later by The House At Pooh Corner (1928). Rare fist edition of The Adventures Of Winnie The Pooh, 1926. To buy this at auction you would have to pay approx. $6-7,000. Winnie the Pooh with his head habitually stuck in a “hunny” pot. These deliberate misspellings have disturbed generations of educators trying to teach spelling. Please note other misspellings in the later video clips. Christopher Robin with his friend Winnie the Pooh. Look closely at Christopher’s face and compare it with the earlier photographs. Shepard’s drawings were very true to the real-life likeness of the young boy. 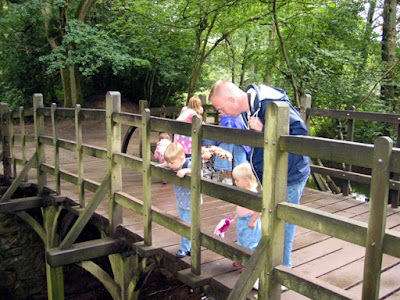 Visitors to the Hundred Acre Wood playing “poohsticks” at Poohsticks Bridge. 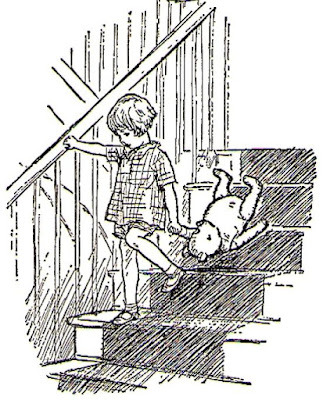 Pooh and Christopher Robin playing “poohsticks.” Illustration by E.H. Shepard for the book “The House At Pooh Corner” (1928). The next adventure in the life of Winnie the Pooh came in 1966 when Walt Disney brought him (her?) to the movie screen in animated form. Earlier in the 1960s the Disney Corporation had bought the rights to the Winnie the Pooh character from the Milne estate. Thirty years later, in 1996, Winnie the Pooh had attained what many had thought impossible: Pooh was now the most popular Disney character of all-time, even outstripping the cultural icon of Mickey Mouse in the minds of children all over the world. According to Disney (and this contradicts a figure/number I stated earlier), Pooh books are published in 40 languages and in just the past FIVE years 85 million Winnie the Pooh books have been sold. Following is a short video concerning the Disney version of the Pooh stories and characters that appeared beginning in the late 1960s. THE WORLD’S GREATEST ROCK ‘N ROLL BAND. The original Rolling Stones: (left to right) Mick Jagger, Brian Jones, Keith Richards, Bill Wyman and Charlie Watts. When the Rolling Stones were formed in 1962 there were two members who competed for creative leadership over the group, Mick Jagger and Brian Jones (who had originally formed the band). They were both geniuses in their own right. Mick was a graduate of the London School of Economics and Brian was a musical prodigy who could play many instruments and could teach himself to play others very quickly. A young Brian Jones just after founding the Rolling Stones in 1962. 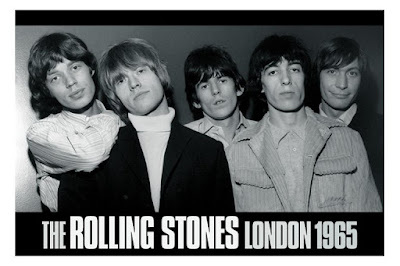 The Rolling Stones were stars and becoming more prominent. Cracks started to appear in the social and professional relationships within the group. Brian Jones was on one side and Mick Jagger and Keith Richards on the other (Jagger and Richards were developing into an outstanding song-writing team). These pressures and the fast paced life-style of the band took their toll on Brian. He started a descent into alcoholism and drug addiction. In June of 1969 he was informed by the other members of the band that he would not be a part of their upcoming plans for a tour of America. 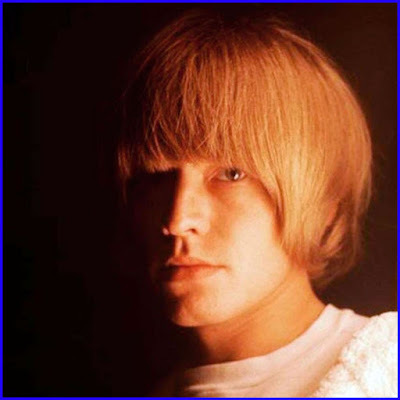 Brian Jones released a statement to the public announcing his departure from The Rolling Stones because of creative differences with the rest of the group. He was no longer a member of the group he himself had created in 1962. The toll Brian Jones’ life style was taking on him was evident in this 1969 photograph. Compare this photo to the one shown above. Brian sought counseling for his problems but was not able to bring them under control. His doctors advised him to escape the fast life of London and seek out a more peaceful atmosphere in which to heal himself. He bought a quiet country home outside of London, but hangers-on and people who were intent on taking advantage of Brian in his compromised condition intently pursued him to his country retreat. But what is the connection between Brian Jones, The Rolling Stones and Winnie the Pooh? After all, what does this “digression” have to do with anything? For the answer we have to return, again, to 1969. 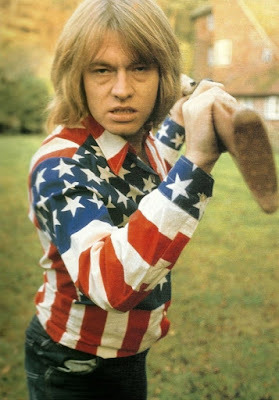 On the night of July 2-3 of that year Brian Jones was found floating, face down, in his swimming pool, dead, at age 27, of a drug overdose at his country home outside of London. 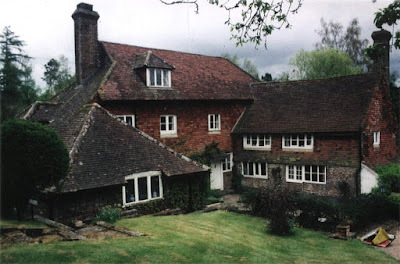 Newspapers noted that Brian Jones’ life had ended at “Cotchford Farm,” the one-time home and estate of Winnie the Pooh creator A.A. Milne and his son Christopher Robin Milne. The irony of having such a tragic event occur in the very same place where, 43 years earlier, A.A. Milne and E.H. Shepard had created the characters and adventures of the Pooh books was lost on many in the sensational aftermath of Brian Jones’ death. Adam Levine, lead singer for “Maroon 5,” is also one of the judges on the hit reality TV show “The Voice.” He and Christine Aguilera teamed up to premier the song “Moves Like Jagger” on the show on June 21, 2011. By September the song had quickly risen to the number one position on the “Billboard Hot 100” chart. Adam Levine and Christine Aguilera. Many observers of the music scene lamented that most of the young people listening to the song had little if any idea what or who “Jagger” was. 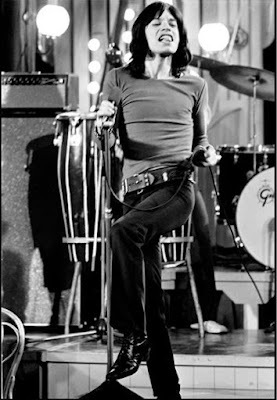 I refer you back to the “Paint It Black” video shown earlier to watch some of the moves that Adam Levine is referring to in his song “Moves Like Jagger.” You Tube has numerous examples of Mick Jagger in top form. I encourage you to investigate. A young Mick Jagger developing the prancing, frenetic performance style that made him famous. commercial that runs before the video. Unavoidable. STEPPING BACK INTO THE STORY. 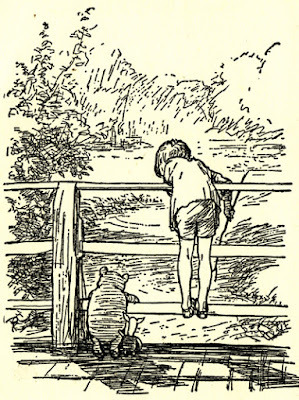 In 1928 A.A. Milne published the most beloved of his Pooh books, The House at Pooh Corner. 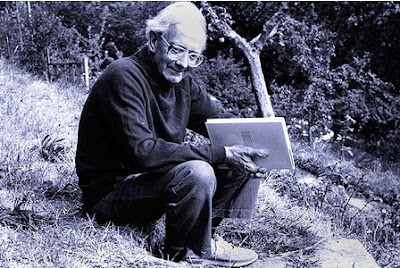 In it he introduced the character of Tigger and the game of “poohsticks.” The book contains the underlying themes of the passage of time, a child growing up, distancing himself from his toys and putting away childish things. It had a profound impact on a musical artist named Kenny Loggins who, with his partner Jim Messina, recorded a song called “Return to Pooh Corner” on their “Sittin’ In” album in 1972. Here is a later video version compiled with many Disney images of Milne’s characters. The words to the song are very reflective and nostalgic. Well, I should let you watch for yourself. Enjoy! 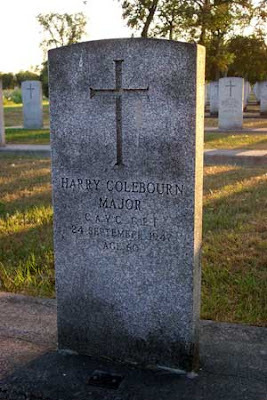 Major (another promotion) Harry Colebourn returned to Winnipeg, Canada, after the War and opened a veterinary hospital. In later life he continued to practice out of his home/clinic until his death on September 24th,1947. Harry was buried in a Winnipeg cemetery. The death notice in the newspaper made no reference to Winnie. 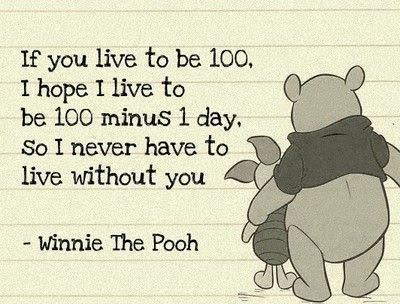 It is a sad note that he never met either Christopher Robin or A.A. Milne. 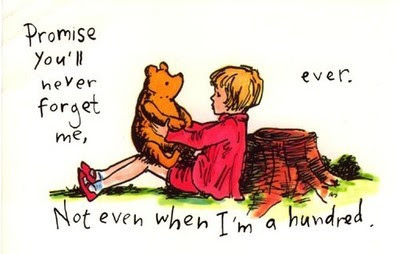 Christopher Robin Milne, born in 1920, lived out a rather “normal” life after leaving his famous childhood behind him. For many years he ran a book shop. He died on April 20, 1996. Christopher Robin Milne in later years. DONE FOR NOW. OH, BOTHER!